Use a fitness DVD or join a class to learn new exercises. If you're wondering how to start an exercise routine in your mid-30s, you'll find that it's not rocket science; you need to move your body more than you currently do and set aside time to do it on a regular basis. 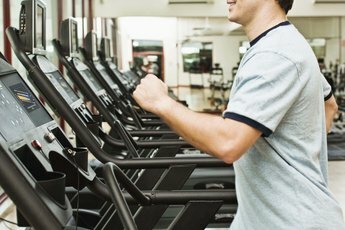 While this seems simple, the surprising truth is that 60 percent of American adults don't exercise on a regular basis, and 25 percent don't do it at all. 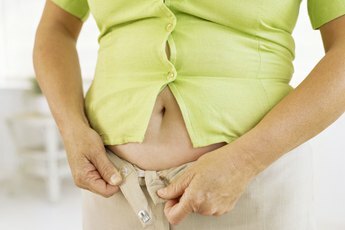 The battle to stay in shape gets even tougher during the mid-30s, when the so-called "middle-age spread" comes calling and women start to gain weight around the abdomen. To rise above the statistics and stay on track with your exercise regimen, set yourself up for success by choosing activities that you love. Brainstorm the physical activities you enjoy, and write them down. If you want to stick with your routine, you have to do things that you will be motivated to keep doing. Think of activities you may want to try out, or things you may have done when you were younger, such as tennis, swimming, cycling or team sports. Make the list as long as possible, and then pick two or three that you can realistically start doing right now. It's important to pick more than one, so you can vary your routine several times a week. Keep the list around and refer to it when you get bored with one activity and need something fresh. Another idea to add to the list is joining the kids in their activities, or practicing with them at home. Make time in your schedule for exercise. The Centers for Disease Control and Prevention recommends 150 minutes of moderate exercise per week, and strength training two times a week, which could translate into about 30 minutes of activity each day. In your mid-30s, you're likely to be juggling a career, kids, a home and possibly even taking care of elderly parents -- all things that make for a serious lack of free time. But if you don't carve some time out of your day and leave exercise as your last priority, you won't end up doing it. Pick a time in which you'll have the energy for exercise -- such as early morning when the kids are still in bed, or during your hour-long lunch break. Then add that time to your calendar, and don't schedule anything else during that time. If you simply don't have time for yourself, make it a family affair; schedule a Saturday hike, a pre-dinner walk or a morning dance party with the entire family. Learn the ropes. 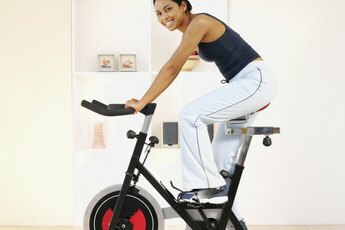 If you've never exercised before, you could start out simply walking or riding a bike -- both completely beneficial exercises -- but you can also enlist the help of a personal trainer or a fitness instructor to learn the proper way to exercise. Look to your local community center -- which often has drop-in classes that don't require membership -- to try new activities and learn new skills. Track your progress by noting when you meet your daily or weekly goals, and then reward yourself with a night out, new clothes or some other special thing when you reach those goals. Make a calendar that notes when you exercised and the activities you did, and keep it in a visible location. Ask for help in meeting your goals. Enlist your friends and family to cheer you on as you continue with your exercise regimen, and make them aware of your goal sheet so they can monitor your progress and give you encouragement when you need it. Better yet, get a friend or family member to join you -- then you'll have each other to answer to when you don't show up for the workout. Include strength training in your routine. Middle-aged woman are losing bone density each year, so be sure to counteract this by including weight-bearing exercises into your routine. Start out doing pushups, situps, leg lifts and lunges at home, or use your local gym or community center to lift free weights or use weight machines. Be sure to talk to your doctor about your new exercise regimen -- especially if you have conditions such as heart disease, high blood pressure or diabetes. Your doctor may have other strategies that can help you integrate safe exercise into your routine.